Writer Bapsi Sidhwa was in London, at the rehearsals of her play Sock'em With Honey, when she heard about a resolution adopted recently by the high priests of the Parsi Zoroastrian community in Mumbai. 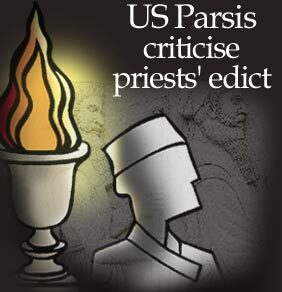 The resolution, published in Jam-e-Jamshed, a weekly published in Mumbai for the Parsi community, March 23, declared that marriages of Parsi Zoroastrian men or women to people of other faiths are invalid under the religion. It also declared the children of such marriages would not be admitted into the Zoroastrian faith. Sidhwa, who was born in Pakistan and lives in Houston, Texas, has raised the same issue in Sock'em With Honey, adapted from her book, An American Brat. "My whole purpose of writing An American Brat, and now the play based on portions of the novel, is to show how difficult these laws are for our children, specially daughters," Sidhwa said in an interview by email. "Up to now, the children of boys who married out were allowed to have their navjote [baptism] ceremony whereas girls (who married outside the community) were not allowed to visit the [Zoroastrian] fire temples nor could their children have navjotes," she says. Sidhwa's daughter married a non-Parsi, and given the rigidity of the non-conversion laws, there was not much the parents could do to reconcile her with the religious community. "(The resolution) is sad news indeed for a community that, I believe, is on the endangered species list," Sidhwa adds. The resolution, signed by the seven dasturs (priests) from Udwada, Mumbai, Navsari, Surat, and Bangalore, points to the increasing number of intermarriages within the community and the initiation of their offspring into the Zoroastrian faith, which it says is against the tenets of the religion. 'If this trend continues, the day is not far when the unique Parsi Zoroastrian identity which the community has zealously preserved since centuries will be diluted and subsequently wiped out,' says the resolution. The issue of conversion and mixed marriages has long rocked the Parsi Zoroastrian community and divided it into the seemingly orthodox and liberal camps. Sohrab Fracis, whose book Ticket to Minto: Stories of India and America won the 2001 Iowa Short Fiction Award, explains the two contrary views while taking the liberal side himself. He says since a group of Zoroastrians came to India, having fled religious persecution in Persia (now Iran), they have lived in fear of depletion of their already small numbers. "Conversion of others to Zoroastrianism was prohibited, some say, initially by Jadi Rana, the ruler of the kingdom on the coast of Gujarat (where the first Parsis landed), but in any case incorporated into our religious laws. So our numbers could not grow through conversion," Fracis says. As a result, religious laws prohibiting marriage into other communities were also put in place. But no community can afford to be an island, he points out. "In many other ways Parsis have assimilated and contributed wonderfully well, whether in India or Canada or America. So why retain this anachronistic blot in our religious policies?" asks the author who has written on the subject. "If the community is as proud of its ancient and influential religion as it professes to be, then it should be inclusive rather than exclusive and should open its arms to anyone who wishes to swell its numbers even for purely philosophical rather than marital reasons," Fracis adds. Lylah M Alphonse, an editor with The Boston Globe, takes the same view. "I think this resolution is ridiculous," she says. "Instead of seizing the chance to bring up the children of mixed religious marriages and teach them to be dedicated Zoroastrians, our high priests have decided to preserve that by ex-communicating the people," she adds. "It seems the only preservation we have is of a relic in a museum." Alphonse says she spoke to her mother, who is a Parsi married to a Roman Catholic born in Haiti, about the resolution. "Her reaction was that Zoroastrianism is something that lives within you whether or not the high priests agree." According to the resolution, the high priests feel the religious scriptures disapprove the marriage of Zoroastrians with members of other communities and faiths. Lovji Cama, a founding member of the Zoroastrian Association of Greater New York, says there have been intermarriages between Zoroastrians and non-Zoroastrians in India and Iran, as per his knowledge. "In previous times they used to quietly bring the children into their religion," he says. "Now it's becoming public and therefore more controversial." Will the edict have an effect in North America? Zahra Sethna, a freelance writer in New York who has married a non-Zoroastrian, says it is not so far-reaching as to affect her or her husband's daily life. "It wouldn't stop us from believing what we believe in." Many Parsis left India, in part, because of the stifling rules and restrictions imposed on them by the high priests, adds Alphonse. "The bulk of us who have married outside the religion, whether they were Indians or non-Indians, we've already effectively been ex-communicated, so they can' t really do anything to us." Cama, who chairs the education and scholarship committee, Federation of Zoroastrian Associations of North America, agrees the resolution will have little effect on Parsis in the US. "It's like trying to close the gate after the horse is gone. I was surprised they bothered to do it." Sidhwa too feels the younger generation in the US and UK will ignore the high priests' "absurd and outdated edicts." Delhi, for instance, ignores the Bombay priests, she says. "In many places, 70 percent of Parsi youngsters are marrying out." Though no clear figures are available on Zoroastrian Parsis in mixed marriages, Cama puts the number at about 20 to 25 percent. There has been no upswing or decline, at least in the New York area, he says. The small number of Parsis and absence of concentration in one area has contributed to mixed marriages as in the case of the other South Asian communities. Fracis says in Jacksonville, Florida, where he lives, he is practically one of a handful of Parsis. In nearby Orlando, there are about eight or nine Parsi families. They are very concerned about such edicts because their children are growing up and starting to look for spouses, he says. "There is the high likelihood that they may find spouses outside the community," he adds. Cama, while agreeing that non-Parsi spouses and children should be accepted into the Zoroastrian religion, does not see the need to encourage interfaith marriages. "There is a fair amount of intermarriage in the community and the children of mixed marriages do not necessarily become Zoroastrians," he says. "In India, there is the argument that you don't accept the children of mixed marriages, so how do you expect them to become Zoroastrians?" he asks. "But here, I think the argument falls apart because in most of the North American communities, the children of mixed marriages are accepted." Sethna's husband, she says, has been warmly accepted into the community. "He is very interested and excited by what he knows of the community," she adds. "The people we associate with in New York have responded very warmly to that." "But if we wanted to visit Udwada and say our prayers at the fire temple, I do think there would be an effect," she says. "More important is the message that is being sent -- I think it's a very negative message and shows Parsis to be exclusionary and racist." The high priests' resolution bars priests from performing marriage ceremonies or navjotes of children where only one of the partners is a Zoroastrian Parsi. One wonders if the priests in the US will abide by it. Homi Gandhi, president of the Zoroastrian Association of Greater New York, says priests are divided between the orthodox and liberal. There may be more of the liberal component in North America. Even if they don't perform the ceremony, they may participate in them. "He is your friend or a relation; you're going to go there and enjoy." "An individual makes his or her decision. I don't think anyone is going to stop doing that," said Gandhi who stresses that his views are not representative of the Association. "A lot of priests I have encountered in North America and Canada are more in touch with members of the community and understand their predicament," says Fracis. "They are part of it; their children also have those situations forced upon them."